One of the better painting and drawing apps on the iPhone, and one of the most useful creative tools I’ve seen, SketchBook Mobile is an indispensable tool if you are a real artist. For everyone else, it is still a fun diversion and extremely easy to use. The core principle behind this app from Autodesk is ease of drawing. The tools never get in the way, but they are always easy to access. Back to the Drawing Board: SketchBook Mobile is a fantastic drawing program that puts the brushes and other tools within easy reach. SketchBook Mobile opens to a black canvas where you can start drawing right away. You access brushes and other tools from a faint, tiny palette on the lower portion of the screen. 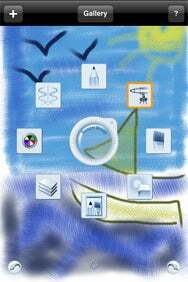 Tap once, and you’ll see a pencil, spray gun, fat brush, erase, brush set, layer icon, color wheel, and a mirroring tool. Each of these will be familiar to canvas painters and Photoshop artists alike. The brush variety tops Brushes because you can tweak just about any variable, including the radius, opacity, and spacing of the thistles. There are brushes that mimic chalk, pencils, and felt tip pens. With this variety, it is possible to create stunning works of art. There’s a caveat, though. Unlike Corel Painter 11 for the Mac or other programs designed in equal measure for artists and non-artists, SketchBook Mobile shines when in skilled hands. If your drawing ability amounts to a few smiley faces and stick figures, SketchBook Mobile won’t turn you into an artist. That said, because the tools are so easy to access, the app is fun to use even for novices. For artists, the iPhone’s screen becomes a handy replacement for a sketchpad, going well beyond offering a blank sheet and some brushes. For example, you can paint in layers and, thanks to the recent 1.1 update, control opacity for layers. So, in one example, an artist added a layer for a guitar, then painted on a second layer to add some accents. There are six layers available on the more powerful iPhone 3GS and three on the original 3G. You can even export these layers to a Photoshop PSD file. SketchBook Mobile has 10 layers of undo. (Either double-tap on the lower left of the screen or access the palette and tap the undo icon.) The app zooms all the way to 2500 percent for fine detail work. The mirror tool—used for symmetric drawing, allows you to paint one side of an image and duplicate it as you draw. The color wheel is also useful: you can save swatches and even paint small areas on the screen like a true Picasso. File management is as easy as choosing brushes and saving layers. The app creates its own gallery, and you can easily select and save images, rename them, add blank canvases, or delete the ones you don’t want. You can import images from the camera roll, either as the base image to paint on or as a new layer. In many ways, the real brilliance of this app is all about the iPhone’s touch-screen interface. It is so accurate, and so fast at rendering what you draw, you can add fine touches to an image. The demo reels reveal how a true artist can create amazing images. In a future release, I’d like to see some canvas treatments—painting on a watercolor board, for example. And, while the help features are detailed, I’d prefer YouTube videos right on the iPhone that show me exactly how to paint. In addition to SketchBook Mobile, Autodesk also offers a slimmed-down version, SketchBook MobileX. This free app is limited by a smaller canvas (320x480) and three layers (instead of six), plus a few other minor differences from its $3 sibling. SketchBook Mobile is not just for pro artists. It’s a rare app that appeals to novices who just want to try painting on the iPhone and professionals who are struck by an idea and want to see how it looks without using up expensive brushes and paper.